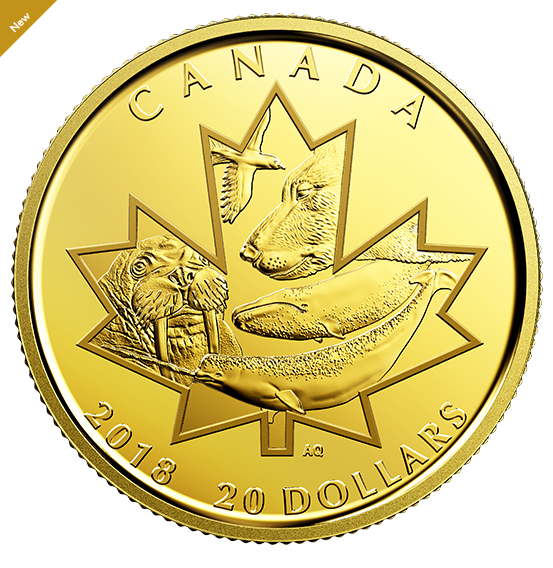 OTTAWA, June 26, 2018 /CNW/ – The Royal Canadian Mint is proud to issue its first collectible coin crafted entirely of Nunavut-sourced gold. Designed by Inuk artist Andrew Qappik, the reverse image highlights the walrus, ptarmigan, polar bear, bowhead whale and narwhal, all framed within the outline of a maple leaf. The beautifully crafted coin is available for purchase as of today. In another innovation, the 1/10 oz. gold coin is struck on newly developed blanks that are thinner and wider than usual, yet with the same relief, allowing for a larger canvas for the Arctic-themed design. The obverse features the effigy of Her Majesty Queen Elizabeth II by Susanna Blunt. "In anticipation of Nunavut's 20th anniversary, the Mint is very pleased to celebrate the beauty and talent that Nunavut and its people add to the Canadian fabric," said the Mint's Vice President of Sales Chris Carkner. "From the responsibly-mined gold, to the artist and his design, Canadians can be proud of this 100% Canadian coin." The coin is crafted from 99.99% pure gold, mined in Nunavut at the TMAC Resources' mine at Hope Bay and by Agnico Eagle Mines' Meadowbank mine, near Baker Lake, Nunavut. "We are honoured that gold from our Meadowbank mine is part of the Royal Canadian Mint's special Symbols of the North collectible gold coin", said Sean Boyd, Vice-Chair and CEO of Agnico Eagle Mines. "Our Inuit employees, suppliers and partners can all take great pride in knowing that they have participated in making this unique coin that celebrates their heritage and culture." The 2018 $20 pure gold 1/10 oz. coin – Symbols of the North has a limited mintage of 1,500 and retails for $359. It can be ordered by contacting the Mint at 1-800-267-1871 in Canada, 1-800-268-6468 in the United States, or online at www.mint.ca. The coin will soon be available at the Royal Canadian Mint's boutiques in Ottawa and Winnipeg, as well as through the Mint's global network of dealers and distributors, including participating Canada Post outlets. The Royal Canadian Mint is the Crown corporation responsible for the minting and distribution of Canada's circulation coins. An ISO 9001 certified company, the Mint is recognized as one of the largest and most versatile mints in the world, offering a wide range of specialized, high quality coinage products and related services on an international scale. For more information on the Mint, its products and services, visit. www.mint.ca.